Parade of Porsches "On the Boarder"
In 1990, PCA implemented a campaign to increase membership. The campaign was successful, and almost 900 new members were enrolled. Based on this success, in 1991 PCA established a National Membership Competition to continue to stimulate growth. The award was first presented at Parade in 1992. Originally the recipient of the award was determined by a formula that equalized each region’s growth, regardless of size. In 1998, PCA added a second category to recognize the region with the highest net growth. Today the awards are known as Greatest Factored Growth and Greatest Actual Growth. The same region cannot receive both awards. The recipients receive both a trophy and a cash award from PCA. Annually, PCA conducts the National Website Contest in which region and zone websites are judged for editorial excellence, design effectiveness, user friendliness, up-to-date content, and usefulness to their respective regions, zones, and members. As a result of the outstanding content and technical advances in past submissions, PCA decided to create an award for the Best Overall Region Website. The award was first presented at Parade in 2012. The Best Overall Region Website Award is presented to the region with highest overall score, regardless of class. The award will not duplicate any National Website Award Class winners. Zone websites are not eligible for this award. The award serves to demonstrate that the real value of any region website is in effectively serving members of the website's respective region. The award also demonstrates the fluidity and dynamics of web-based communications and the ability of the regions to adapt new technologies to meet the expectations of their users. 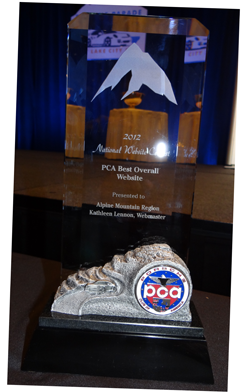 The Paul Heinmiller Memorial Trophy was previously awarded to the region newsletter judged to be the most outstanding for the year, as part of the PCA Newsletter Contest. The Heinmiller Memorial Award was donated in 1970 by the Porsche+Audi Division of Volkswagen of America. Mr. Heinmiller was a past National Vice President. Under Mr. Heinmiller's leadership, Porsche Panorama became a professionally executed publication both in physical layout and graphic art, as well as in refinement of its content. Almost every region has members who belong to PCA because of Panorama and who continue to renew their memberships to receive what has become the finest single-marque, club-sponsored publication in the world. The Betty Jo Turner Newsletter Award for Newsletter Excellence was created in 2012 to recognize retiring Panorama Editor Betty Jo Turner. This award replaced the Paul Heinmiller Memorial Trophy, which was retired. For the PCA Newsletter Contest, regions compete in one of five classes, based on region membership as of December 31st of the competition year. Basing the classes on region membership is intended to ensure that regions competing for the five separate class awards have reasonably equal resources. The Betty Jo Turner Award for Newsletter Excellence does not duplicate any of the class awards. The evaluation criteria are: Information and Navigation; Overall Layout and Appearance; Editorial Commentary; Event Publicity and Follow-Up; Photography and/or artwork (Illustrations, Clipart); Technical Articles and Automotive Tips; Availability in Digital Format to Members; Features and Article Contributions from Members; and General Scope and Variety. Top editors from around the country are selected to help with the judging of other regions' newsletters. They assign scores for each category. Points are given for the number of issues published by the region during the year. Once class winners have been decided, the top entry from each class is then re-evaluated by a second set of judges to determine the overall winner of the Betty Jo Turner Award for Newsletter Excellence. The Glenn Lazar-Harry Blanchard Memorial Trophy was established by the late Bruce "King Carrera" Jennings as an annual award to be presented to the region member who best exemplifies the spirit and guidelines of PCA. The award is more commonly known as the “Enthusiast of the Year” Award. The recipient is a true “Porsche Enthusiast” and an outstanding member of PCA. The recipient is an exemplary participant in region activities and shows initiative in support and organization of ongoing activities and the development of new activities. Any active member of the Porsche Club of America is eligible for this award, with the exception of any person serving in a position on the PCA National Staff during the award year. 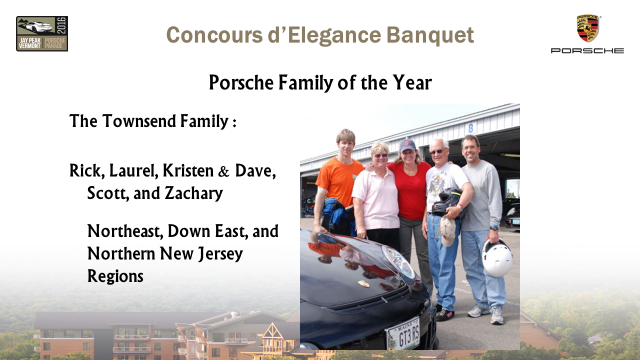 The Porsche (PCA) Family of the Year Award was originally titled the “Leroy Spanjol Memorial Award” and first presented at Parade in 1968. The award was first sponsored by the Porsche family and continues to be sponsored by Porsche AG. The award was renamed the Porsche Family of the Year Award and presented under this title at Parade in 1974. The trophy is presented to the PCA family that demonstrates the most exceptional standards in support to their region and PCA. Any active member of PCA and his or her family members are eligible for this award. For purposes of this award, a family is defined as parents with children living at home, parents with no children living at home or a couple without children. The Ferry Porsche Trophy was named in honor of the late Dr. Ferdinand "Ferry" Porsche and first presented at Parade in 1961. It was sponsored by Porsche AG and Porsche of America Corporation, but today PCA is the sole sponsor of this award. The trophy is presented to the outstanding PCA region of the year that demonstrates the highest standards in meeting the objectives and ideals of the Porsche Club of America and “In Appreciation of Loyalty to the Porsche Car and the Porsche Idea.” Historically, PCA awarded the Ferry Porsche Trophy to one region. 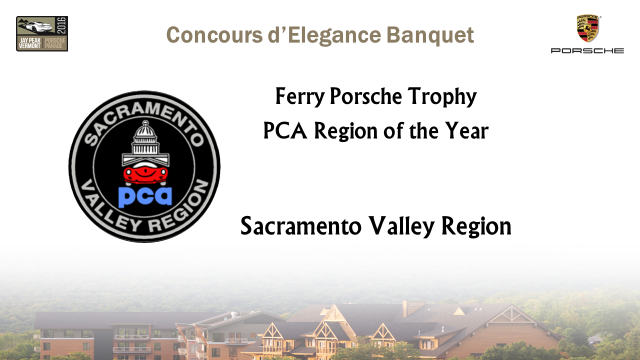 In 2010, in an effort to recognize more regions for their outstanding achievements, the PCA Executive Council decided to award first and second runners-up for the Ferry Porsche Trophy. Since the Porsche Club of America was formed in 1955, regions have prioritized community service and charitable contributions. In 2002, PCA decided to recognize the unique and diverse programs implemented by regions throughout PCA in support of public service. The PCA Public Service Awards recognize the regions that have conducted the most outstanding charity or community service event or events during the year. The winning regions demonstrate the highest standards in meeting the objectives and the ideals of the PCA in providing service and support to charities and the community. Due to the importance of public service to the club, and the number of PCA regions involved in public service, it was decided to present multiple awards. Awards are presented for first, second, and third place and honorable mentions. Recipients receive a trophy and cash award. The Bill Sholar Memorial Award, or “Sholar Award,” is in honor of the founder of the Porsche Club of America. The award is presented to a member in recognition of outstanding contribution to PCA, above and beyond the execution of normal responsibilities. The award was created by the PCA Executive Council in 1982, after the death of Mr. Sholar, and presented at that year's Parade. The award is presented at the discretion of the Executive Council and may or may not be presented every year. 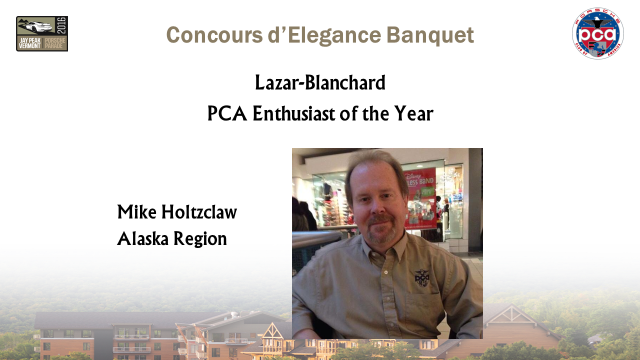 Unlike other PCA awards, all Executive Council, National Staff, Committee Chairs, Zone Representatives, Special Appointees, and Honorary PCA Members are eligible for the Sholar Award. 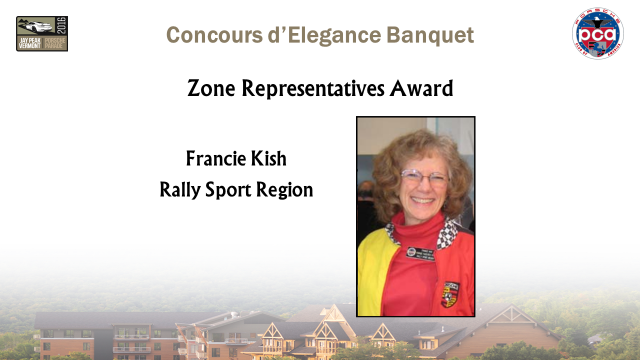 This award is presented by the Zone Representatives to individuals within Porsche Club of America who, in the opinion of the thirteen Zone Representatives, have distinguished themselves by making outstanding contributions to the club. The PCA Zone Representatives Award is made solely at the discretion of the Zone Representatives. This unique award may or may not be given annually. Porsche Parade 2016 is a registered trademark of the Porsche Club of America.